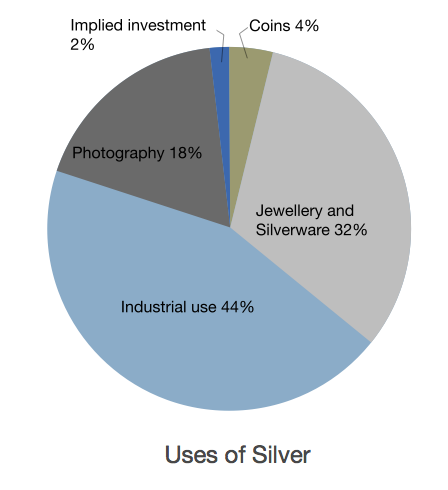 Global silver demand is dominated by three main sources: Jewelery, silverware, industrial uses, and photographic fabrication. Industrial uses remain the largest demand for silver because silver is a excellent conductor of electricity. Silver is used in many electrical applications, including switches, contacts, and fuses. For example, a typical washing machine contains 16 silver contacts. Silver is also a good conductor of heat, so silver is used in the rear-window defrosters of many modern cars. The tiny silver/ceramic lines conduct heat onto the glass, therefore clearing the frost, ice, and condensation. Among other industrial uses, silver has a variety of uses in the health care industry. For example, silver sulfadiazine is used to treat burns, and silver is sometimes used in tooth fillings. Silver is the best reflector nown- it is used in mirrors and in coatings for glass or other metals. Industrial demand in 2004 rose by 5% to 67.1 million ounces with electronic uses spearheading the gains. And, expert analyst expect the industrial use of silver to continue to lead the rise in demand for silver. Another large use of silver is photographic paper and film. Around one ounce of silver is able to produce approximately 5,000 color photographs. While in 2004, Photographic demand fell for the fifth year in succession to 181.0 million ounces. Jewelry is yet another main source of demand for silver, as silver is the least expensive precious metal. Many people enjoy the the silvery-white color, softness, luster, high reflectivity and abundant supply of silver make silver the ideal material for jewelry and tableware. Normally sterling silver, an alloy of 92.5% silver and 7.5% copper is used. The major jewelry manufacturing countries are India, Italy and Thailand. While in 2004, jewelry and silverware fabrication fell by almost 10% to 247.5 million ounces, which is a nine year low. Coins are classified under the jewelry category, and silver was one of the earliest metals used to make coins. The Romans used silver in this way as early as 269 BC (more than 2000 years ago). However, Mexico is the only country today that uses silver in its circulating coinage. In Australia, the 1966 fifty-cent piece was the last coin in general use to contain silver. Today most coins are used as bullion coins for investors. The usage of coins and medals increased 15% in 2004 to a ten year high of 41.1 million ounces. And in 2004, the implied net investment of silver rose by almost 400% to a substantial level of 42.5 million ounces.